From the publisher of Tennessee Attorneys Memo, this essential reference was created by General Sessions Judge G. Andrew Brigham and Nashville attorney Thomas B. Norris, Jr., to assist judges and attorneys who practice in Tennessee's general sessions courts. 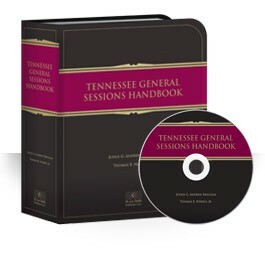 Packed with more than 500 pages of valuable advice on procedure and policy, the Tennessee General Sessions Handbook covers both civil and criminal sessions, and includes a BONUS CD-ROM loaded with forms and a searchable index. "Judge Brigham and Mr. Norris have achieved something unique: a thorough, well researched handbook that is nevertheless easy and pleasant reading. Efficiently organized by civil and criminal matters, and then in the chronological development of a civil or criminal lawsuit in Sessions Court, it is easy to get the knowledge you need to get up to speed. Example: no one really likes reading about execution, levy or garnishment. We tend to struggle to learn these areas when a debtor doesn’t voluntarily satisfy a judgment. But with the Tennessee General Sessions Handbook, an understanding of Rule 69 and execution on judgments can be achieved painlessly and quickly because chapter 5, “Securing Relief,” is well written. Likewise, you want to know if the admissions of the accused are admissible in a preliminary hearing, or if Miranda may be implicated. Chapter 17 on “Defendant’s Rights” holds the answer, with ample references in support. Need a form? The Handbook comes with the civil forms you need on a CD. But be warned: you might start researching a particular area and get hooked and read it cover to cover. That’s all right, though, because you’ll become a more competent Sessions Court practitioner if you do." Judge Brigham commenced his law practice in Chattanooga. His areas of concentration include choice of entity, mergers, acquisitions, real estate transactions, health care, and employment law. Judge Brigham assumed the bench in 2003, having jurisdiction over matters of general sessions and juvenile court. Mr. Norris is of counsel to the Law Offices of Barry J. Gammons in Nashville and has practiced in virtually every general sessions court in the state. He focuses his practice on small businesses in the areas of business formation, acquisition and merger, exempt securities, secured transactions, sales, leasehold, tax, and estate planning. Civil general sessions courts handle matters of collection, contract dispute, personal injury, interpleader, subrogation claims, boundary line disputes and partition, matters between landlord and tenant, recovery of property, matters dealing with juveniles, small claims of varying types including mechanics' and materialmen's liens, and, in some counties, concurrent jurisdiction over domestic and probate cases. Criminal cases heard by general sessions courts include preliminary hearings in all criminal cases, misdemeanor trials when a jury has been waived, and most violations of municipal ordinances.